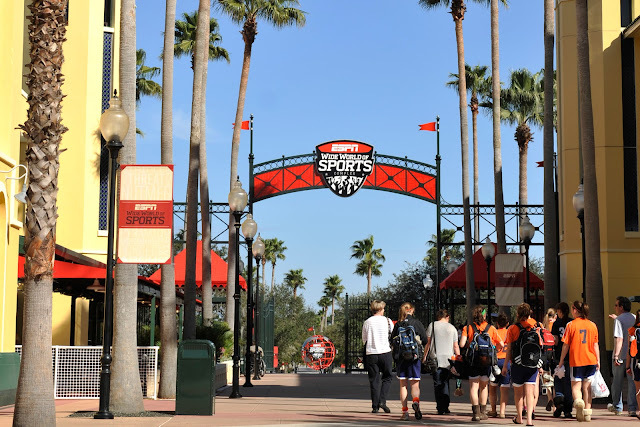 Today we take a closer look at the amazing facility that is the ESPN Wide World of Sports located at Walt Disney World Resort in Orlando, Florida.  Architect: David Schwarz (Washington, D.C.). Schwarz also designed The Ballpark at Arlington, home of Major League Baseball’s Texas Rangers.  Design: “Florida Picturesque” style embodies a Florida- or Mediterranean-flavor design with Spanish-style roofing, blue and green accent tiling, vibrant yellow colors and symmetrical tower-like structures.  Venues: Champion Stadium, HP Field House, Jostens Center, Hess Sports Fields, Baseball Quadraplex, Softball Complex, Tennis Complex, Track & Field Complex, including cross country, covered training facility, Production Center and Welcome Center. 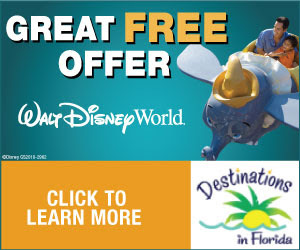  Other amenities: Expanded retail pop-ups (four locations), HP Creation Center, ESPN Wide World of Sports Grill, PlayStation Pavilion, a welcome center and a parking lot with more than 5,000 spaces.  The centerpiece of the sports complex, Champion Stadium is a retro-style Major League Baseball ballpark that annually hosts MLB spring training (Atlanta Braves) and numerous amateur tournaments. With permanent seating and existing infrastructure, the facility can also host concerts, corporate hospitality functions, event opening ceremonies and other large gatherings.  Maximum capacity for 11,500 guests, including 9,500 permanent upper and lower deck seats (80 percent are located between first and third base), plus a grass berm in left field that offers seating for an additional 2,000+ guests.  Four luxury suites (all include indoor and outdoor seating areas), plus an additional suite that features a large conference room; two upper-level outdoor suites; and two mezzanine-level outdoor terraces.  Display booth equipped with state-of-the-art production equipment for managing in-stadium entertainment, including a 33′ 7″ wide by 21’7″ high jumbo screen which can display ESPN programming, customized videos, daily highlight reels and interviews from the sports complex.  2,500 square foot state-of-the-art facility with eight edit bays and uplinks to ESPN in Bristol, Conn., Los Angeles and New York.  56 high-definition cameras (42 robotic, 10 handheld and four studio) and 40 high-definition video screens, including 3 jumbo screens that can capture and display footage, event highlights and interviews that will broadcast throughout the complex and on various Disney and ESPN platforms.  165,000-square-foot multi-sport indoor arena includes high arches and trusses and other architectural and design elements reminiscent of a classic 1950s style fieldhouse (capacity: 5,500). This multi-purpose facility can accommodate virtually any indoor sport that does not require ice, including basketball, wrestling, gymnastics, volleyball, martial arts, team handball, roller hockey, cheerleading and dance, trampoline and tumbling, indoor tennis, etc., in addition to concerts and conventions.  The HP Creation Center offers guests a place to download, design and enhance commemorative event photos and images, then immediately produce and print them onsite. It also includes a retail area featuring a variety of imaging-related product options for athletes and consumers, such as creating life-size posters of action photos, wallpaper covering and other photo keepsakes.  The fieldhouse has room for six full-size collegiate basketball courts (four on main level and two upstairs on auxiliary court).  A state-of-the-art multi-sport fieldhouse, Jostens Center includes space for six college-size basketball courts, or 12 regulation-size volleyball courts, or two roller hockey rinks, and four locker rooms, two conference rooms and two officials’ rooms.  The Sports Fields venue, sponsored by Amerada Hess Corporation, are large enough to accommodate a variety of outdoor sports — soccer, football, lacrosse, baseball, field hockey, rugby, softball, cricket, etc. The seven grass playing surfaces and four fields may be used collectively for one large event or multiple events may take place simultaneously on various fields.  Permanent bleacher seating is available at each field and additional bleachers may be added for larger events (capacity: 10,000).  The Baseball Quadraplex includes four professional baseball fields and a half field (used for infield drills). The quad annually hosts MLB players during spring training and minor league players during Rookie League (Gulf Coast League) and Fall Instructional League seasons, as well as camps, clinics and tournaments for amateur and youth players.  The Softball Complex includes six fields that can accommodate fastpitch and slowpitch softball, as well as youth baseball (12 and younger).  Tennis complex includes 10 “HAR TRU” green clay courts, including a stadium court, and can accommodate events ranging from youth clinics to major professional tournaments. Formerly hosted U.S. Men’s Clay Court Championships on ATP Tour (1997-2000).  World-class 400-meter polyurethane Track & Field Complex meets IAAF world governing body standards and measurements, and is consistent with Olympic T&F venues throughout the world.  The Track & Field Complex features an adaptable Cross Country Course.  An enlarged and enhanced sports-themed fast casual restaurant with indoor and outdoor seating located across from Champion Stadium. The restaurant contains a full bar and menu items include burgers, pizza, signature sandwiches and salads, along with a variety of desserts and beverages.  Includes high-definition TV screens, live radio remote capabilities and a SportsCenter desk.  New home for the Emerging Technology group at ESPN Wide World of Sports Complex.  Facility develops various broadcast-related technologies that eventually may make their way to air on ESPN Networks.  ESPN has utilized the sports complex and its numerous sporting events to build and test future on-air applications, such as player and object tracking and player game simulation. The PlayStation Pavilion features 17 state-of-the-art PlayStation 3 systems, including a SingStar stage, and a collection of just-released game titles. HP Kiosks - HP kiosks featuring the latest HP TouchSmart technology also provide fans field assignments and schedule updates. These kiosks give guests the opportunity to create personalized avatars- which users can then enjoy one-click access to print, e-mail or share their designs with a personalized message or upload directly to Facebook.